Here's a new one for me. Though I like reading all kinds of romance, I'll be doing this one even though only contemporary romance is allowed. Will try to find other challenges for other kinds of romance. For this, I'll pick Level one for now, but may go up. Sign up at Book Vixen for this one. The Contemporary Romance Reading Challenge was originally created and hosted by Pearl’s World of Romance, then was passed on to Fatin atRomance Book Maven, and is now hosted by The Book Vixen. Runs January 1, 2015 – December 31, 2015 (books read prior to 1/1/2015 do not count towards the challenge). You can join anytime before 9/30/2015. Sign up on The Book Vixen’s blog. The goal is to read as many Contemporary Romance books as you’d like. Books that qualify for this challenge can be young adult, new adult, or adult. Books can be M/F, M/M, or F/F. Books must be a work of fiction (sorry, nonfiction does not qualify for this challenge). Romances with the following elements do not qualify for this reading challenge: paranormal, historical, time-travel, fantasy, science fiction, or mystery/suspense/thriller. See the different levels below and pick the one that works best for you. You can move up a level as often as you’d like but no moving down. Remember, the idea is to challengeyourself. To join this challenge, grab the 2015 Contemporary Romance Reading Challenge button below and post this reading challenge on your blog to track your progress. Please include a link back to this sign-up post so others can join the reading challenge too. You do not have to be a book blogger to participate; you can track your progress on Goodreads, LibraryThing, BookLikes, etc., so as long as you have a dedicated shelf for the 2015 Contemporary Romance Reading Challenge and your profile is not private. The point of linking up is to have a place where people can see what you’re reading. Do you enjoy reading romance but also crave a bit of mystery and suspense? Then this is the reading challenge for you! The goal is to read as many romantic suspense novels as you’d like. See the different levels below and pick the one that works best for you. You can move up a level as often as you’d like but no moving down. Remember, the idea is to challenge yourself. To join the challenge, grab the 2015 Romantic Suspense Reading Challenge button below and post this reading challenge on your blog to track your progress. Please include a link back to this sign-up post so others can join the reading challenge too. You do not have to be a book blogger to participate; you can track your progress on Goodreads, LibraryThing, BookLikes, etc., so as long as you have a dedicated shelf for the 2015 Romantic Suspense Reading Challenge and your profile is not private. The point of linking up is to have a place where people can see what you’re reading. Calling this complete as of November 3, even though I haven't read any books for this challenge since July. It's getting time to wrap up challenges and I don't see myself having time to read anymore for this one. 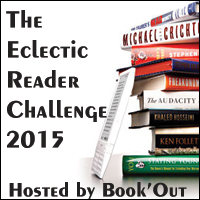 Link up here to declare your addiction to that beautiful thing: The Reading Challenge. Reading Challenges of all sorts and sizes. Those that require you to read certain genres. Those that want colors or animals or certain kinds of words in the title. Those that help you tackle your TBR piles and those that seem to encourage you to add more to the stacks. You got 'em we want to know about 'em. Help us feed our Reading Challenge mania and join in to offer support and encouragement along the way. Check out the "About" page to see what levels of addiction we support and to help you design a sign-up post. Let us know who you are (Go on, say it with us: "Hi, my name is Bev, and I'm a Reading Challenge Addict." There, see, not too hard. ), a link to your sign-up post, and an email address (so I can contact you about any challenge prizes along the way) in the Linky below. New challengers welcome until November 2014. Quiz: What "Hunger Games" Character Are You? You are a gentle, compassionate, and introspective person. You love to take care of people. You are good at anticipating what others around you need before they even know that they need it. You are sensitive that way. You may be underestimated at times. People don't know how tough you are until you're pushed to your limits. You prefer peace, but you will fight for what's right ... especially when it concerns those that you love. What Hunger Games Character Are You? Quiz: What is Your "Hunger Games" Name? What's Your Hunger Games Name? In it’s fourth year, the aim of The Eclectic Reader Challenge is to push you outside your comfort zone by reading up to 12 books during the year from 12 different categories. Create a blog post committing to your participation in this challenge. * If you don’t have a blog you are still welcome to sign up. You can create a shelf for the challenge at Goodreads or LibraryThing or a similar site Just include your name and a link to your shelf. Select, read and review a book from each category listed below during the year for a total of 12 books. A book may be in print, electronic or audio format. * You can choose your books as you go or create a list in advance. You may combine this challenge with others if you wish. * Where a book is identified by more than one genre eg historical romance, it may only count for either the historical fiction or romantic fiction genres – not both. * You can read your chosen titles in any order, at any pace, just complete the challenge by December 31st 2015 to be eligible for the prize drawing. Share your review with other challenge participants by posting your name/blog name and title of the book with a direct link to your review in the Linky. Remember the titles I’ve given here are only examples, you can by all means use them if you want to but it’s not necessary. There are plenty of other books that will fit the categories and you may have some in mind already or even some on your shelves you can read. Books cannot overlap categories (for instance my example of Black Swan Rising for ‘an animal’ could be used for the ‘colour’ category or ‘animal’ category, but not both). Introducing the Newbery Reading Challenge 2015!